Six seconds to read this message and Twenty-Four hours to save the girl. 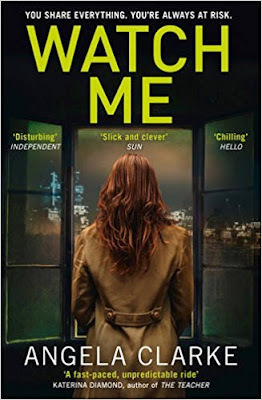 Watch me is the second novel in Angela Clarke's Social Media Murders series. Nasreen and Freddy are back and this time they are on the search for a killer who is making it look like young girls are committing suicide. This killer is going by the name Apollyons revenge linking back to the previous case Nasreen and Freddie worked together. The killer also goes by the name Alex Black, Having already killed one girl, the sister of a girl Nasreen and Freddie knew when they were kids, the same girl there big secret involves. Black has now managed to get hold of the numbers of everyone on Nasreen's team and also Freddie's. When Black takes a second girl hostage and uses Snap Chat to message Freddie, Nasreen and all her team to tell them they have six seconds to read the message and only twenty-four hours to save the girl. The girl turns out to be Nasreen's Dci's sister. With Nasreen having slept with the Dci the night before how long can she keep it a secret that shes the link between the two victims. Will Freddie an Nasreen's secret come out for everyone to know? Does the original Apollyon have anything to do with this case? Is twenty-four hours enough to save a girls life. Well what can i say, i was so excited to read this book after i read the first one as i enjoyed it so much and i couldn't wait to get started on this one i brought it straight away. Well i was not let down. This book is just as good if not better than the first one. I am loving this series and Oh my goshie i cannot wait for the third one to come out in June. In this book i felt you got to know Nasreen more as a character, i felt it was like she came out of her shell a lot more and i really loved seeing the more rebellious side of her. Freddie i just love her she is my favourite character i love her one liners and quirky come backs and sarcastic comments. She reminds me a little of myself actually as i too am a little too sarcastic and i tend to engage mouth before brain so i love having a character i can relate to. I literally spent all of last night reading until i couldn't keep my eyes open any longer and then today i have spent the day snuggled in my reading snug reading all day. What a way to spend the day especially on a lovely summers day like today, doors open, sun shining, cold drink and an amazing book. Serious praise to Angela Clarke. You have made your way onto my list of favourite authors and your books are ones i shall be rereading over and over again i can be certain of that. 5* for this book cause it deserves nothing less. Roll on June 15th when book 3 is released.